红细胞前体内的粉红色核内包涵体是微小病毒感染的典型特征。微小病毒或“ 第5 疾病”是一种自限性感染，在儿童能产生似面部被打的皮疹，在成年人往往不被注意。然而孕妇可将病毒传给胎儿，并且导致胎儿严重贫血、水肿及宫内死胎。 The pink intranuclear inclusions in the erythroid precursors seen here are characteristic for parvovirus infection. Parvovirus, or "fifth disease" is a self-limited infection that can produce a "slapped cheek" appearance of a rash in children, and often goes unnoticed in adults. 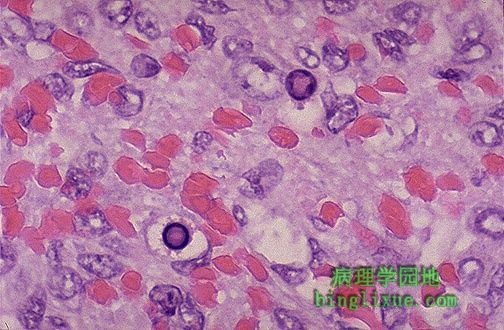 However, pregnant mothers can pass the virus to the fetus, and a severe anemia with fetal hydrops and intrauterine demise can result.